About a month ago, Samsung reached out to see if I was interested in checking out its latest personal color printer, which happens to be NFC-enabled. I was. The company says the printer it sent, the Xpress C460FW, is the "world's first laser printer with NFC technology." I'm not so sure that's true, because a quick Google search turned up a number of other NFC-enabled printers from Brother and HP. Either way, it's the first NFC printer I've used. The idea sounds cool, but in practice, it's just not that valuable. Near Field Communications (NFC) technology, a short-range wireless technology that lets you quickly share data between compatible devices, is not new. My first phone with NFC was a BlackBerry 9900, which I got in 2011. But NFC is taking a long time to catch on. NFC has real potential, and I wrote about a very cool, and valuable, way that Good Technology is using NFC last year. Payment companies clearly see promise in the technology. NFC is a key component in the ISIS Mobile Wallet, and there are more than 2.9 million NFC-enabled payment stations at retail locations across the world, according to ISIS CEO Michael Abbott, who spoke at the MobileCon conference in October. And Matt Bancroft, president of Mobile Helix, a mobile security company, told me earlier this week that he expects NFC to become "an increasingly mainstream and powerful technical enabler of mobile productivity." But of all the various wireless technologies in my gadgets, NFC is by far the one I use least often. In fact, I've yet to find a use for NFC that's truly compelling or that some other technology can't do just as well. Android Beam, which uses NFC to transfer files back and forth between Android devices, works well, but I never use it; I just email files or share then via the cloud. Samsung's TecTiles don't work well -- at least in my experience -- so I never use those either. NFC has been lauded as the future of mobile payments, but I still don't use any of the NFC mobile wallets. Samsung's printer is another example of NFC as novelty and not tech that provides real value. Here's why. I'm not going to review Samsung's printer here. In my experience, the features that aren't related to NFC work just as well as you'd hope - though the wireless network setup was tedious, and it keeps telling me the paper tray is empty when it's not. This story is about NFC, so I'll stick to that feature. Here's how you might imagine an NFC printer would work: You pick up your phone or tablet; open a document, image, whatever; tap your device against the printer and, voila, NFC-enabled printing. Not too different than what you might have envisioned, right? Here's the problem -- or, problems. Second, every time I try to use my Samsung Galaxy S4 to print via NFC, the printer recognizes the device when I tap the NFC panel but initiates Wi-Fi Direct - a different wireless technology - to actually print the page. I don't really care which wireless tech is used as long as I can easily print my content. But all the NFC does is open up the Samsung app on my mobile device and then let me tap the printer again to print instead of just tapping your device display. More often than not, tapping the second time doesn't work; it just reestablishes the connection to my mobile device. I still had to actually hit the Print option in the app. In Samsung's promotional video (above), you see smartphone users tapping their phones to random printers in hotels or libraries and then quickly moving along. My experience was quite different, and it usually ended up with me manually hitting the print button to print my document. All NFC did for me was open an app. In other words, the NFC functionality in the Xpress C460FW is a novelty, and it doesn't really add true value to what's already a full-featured printer. You also have to unlock your device if you use a password or code, so you're fiddling with it anyway. Why not just open the app manually and print that way? The process was even less smooth when I tried to print via NFC using non-Samsung devices such as Google's Nexus 7 tablets (both the 2012 and 2013 versions.) The printer recognizes the devices when I tapped them to the NFC spot, but then I get error messages telling me there's some kind of problem connecting. Eventually they both connect via Wi-Fi Direct, and I have to use the app to print when I'm ready. Again, not really a huge issue because I was able to print, but why even use NFC at all? I was excited to try out the NFC features but was quickly disappointed. Samsung's Mobile Print app lets any compatible device print wirelessly to enabled Samsung printers even if they don't have NFC, and that's actually quite useful. If you have a Samsung printer and haven't downloaded the Mobile Print app, you should. But I definitely would not pay extra for an NFC printer at this point -- and even if I did, I don't think I'd ever use the NFC feature. Samsung's suggested price for the Xpress C460FW printer is $400, which isn't cheap. 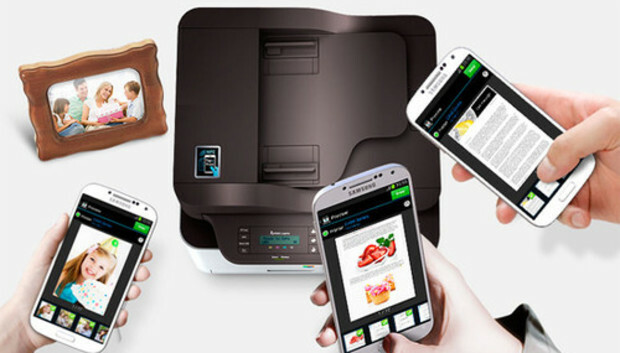 Learn more about the Xpress C460FW and the company's additional NFC-enabled printers on Samsung's website.